Lisa Kivirist and her husband John Ivanko wrote the book Homemade For Sale, which is an excellent resource for anyone who wants to start or grow a cottage food operation. 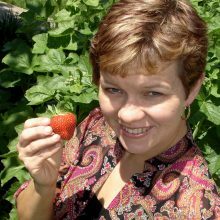 I spoke with Lisa about her progression from Corporate America to entrepreneurial eco-farmer to author/speaker/activist. You can listen to the interview by clicking on the audio player above, or use one of these download links: MP3 | OGG. If you’d like to learn more about Homemade For Sale, you can read my review or check out some excerpts from the book. Also, you can learn how to buy it at a discount. 1:57 – What was it like to move from a corporate job to a farm? 3:04 – What caused you to change your lifestyle? 4:22 – What would you say to someone who wants to make the transition to being their own boss? 6:10 – Should someone quit their job to start a CFO? 8:00 – When is the right time to quit a corporate job? 9:32 – What challenges did you face when starting a business? 10:53 – What’s the difference between a hobby and a business? 15:25 – What are the first steps for starting a CFO? 18:34 – How does someone grow their CFO? 22:12 – What are your next steps? Where would you like to see the cottage food industry go? 25:23 – Why did you write Homemade For Sale?